The oyster trade in Mumbles reached prominence between 1850 and 1873. Ten million oysters were landed in 1871, with a value of £50,000. 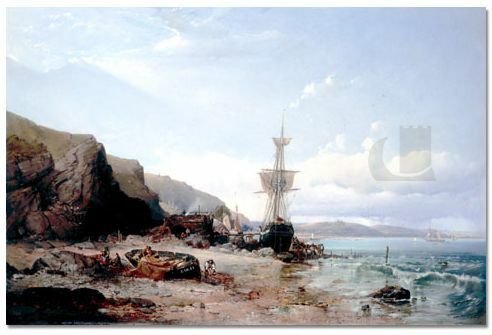 The original oyster dredgers were large, open boats with a single lugsail. Later cutters were used, though still known as skiffs, with a crew of three, master, man and boy. The skiffs were fitted with two dredges, of a distinctive Mumbles design, a sharp blade to scrape the oysters off the bottom with a four foot wide bag which when full could weigh 508 kilos. By the late 1920’s Swansea’s fishing industry was centred on the South Dock basin where extensive wharves had been constructed for the deep-sea steam trawlers introduced to Swansea in 1901. By 1928 the trawler fleet was landing upward of 15,000 tons of fish per annum. Cockles were gathered, mainly by women, using scrapers and rakes to dig them from Llanrhidian sands at low tide. They would then be transferred to sieves, with legal mesh sizes, before being bagged for market. They were originally put in sacks that were transported to the foreshore by donkey. Penclawdd cockles enjoy an international reputation.